The Del Mar Thoroughbred Club‘s second consecutive fall meet begins Thursday, with 20 days of racing through Nov. 29 — five days more than last year. Opening day festivities include a “Hollywood Fashion Contest” offering more than $3,000 in prizes. The three categories are most glamorous, best- dressed couple or most debonair man, and best look-alike of a celebrity or famous character. The grand prize is a two-night stay at L’Auberge Del Mar in a coastal room, plus dinner and breakfast for two. Beginning at 11 a.m., race goers can fill out an entry form and have their picture taken. The entry deadline is 1:30 p.m. Winners will be selected by representatives of the Del Mar Thoroughbred Club based on creativity, fashion style and total ensemble. The winners announced after the fifth race. The first and second place winners in each category must be present to win. While the summer first post is usually at 2 p.m., races during the Bing Crosby Meet will begin at 12:30 p.m. most days. 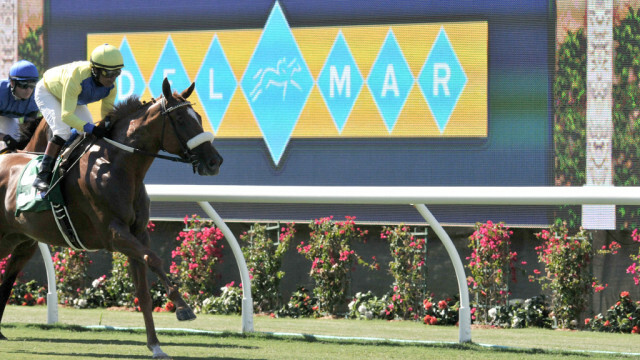 Races on the Del Mar track will begin at 12:45 p.m. Friday and Saturday because of the Breeders’ Cup. The Breeders’ Cup races will be shown on the track’s television sets, with racing on Del Mar’s track held between the Breeders’ Cup races beginning at 12:45 p.m. Racing will begin at 11 a.m. on Thanksgiving. The 50-cent Trifecta will make its California debut today. Betters are required to select the first three finishers in a race in order. It had been previously offered at the $1 level. The Trifecta will be offered on every race on every card. General admission is $6. Reserve seating costs an additional $8 today and Saturdays, $6 on Sundays and $4 on Fridays and the meet’s other Thursdays. General parking is $10.